Non- swiveling. Adds security for doors, cabinets and gates. Rust resistant. 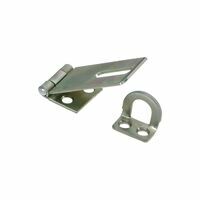 National Hardware Safety Hasp, Non-Swivel, Series: V30, 0.44 in Diameter X 0.9 in Height Shackle, 4.56 in Length, 1-1/2 in Height, Hot Rolled Steel, Zinc Plated, Includes: Rigid Non-Swivel Staple, BHMA A138.18 Certified, 3-1/4 in, For Securing a Wide Variety of Doors, Cabinets, Boxes and Trunks Screws are concealed when hasp is locked. Rust resistant. Zinc plated. Adjustable staple. 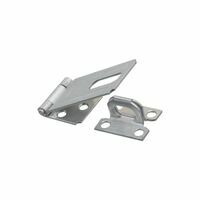 National Hardware Hinge Hasp, Series: V288, 3/4 in Height Shackle, 5-1/4 in Length, 1-5/32 in Height, Hot Rolled Steel, Aluminum Pin, Zinc Plated, BHMA A138.18 Certified, 3 in, For Regular or Around the Corner Applications Use on cabinets, doors and gates. 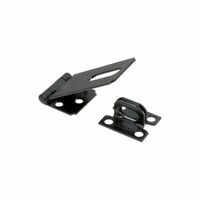 Mounting screws are concealed when the hasp is closed. 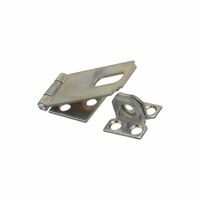 Screws are concealed when hasp is locked. Rust resistant. Zinc plated. Adjustable staple. 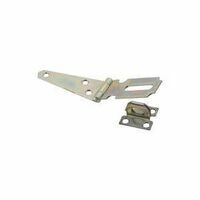 High security pinless hinge. Non- swiveling. 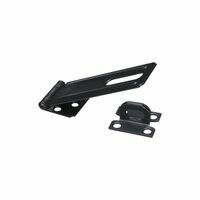 Adds security for doors, cabinets and gates. Rust resistant. High security pinless hinge. 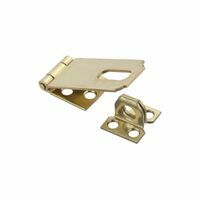 National Hardware Safety Hasp, Non-Swivel, Series: V30, 0.44 in Diameter X 0.9 in Height Shackle, 4.56 in Length, 1-1/2 in Height, Hot Rolled Steel, Brass, Includes: Rigid Non-Swivel Staple, 3-1/4 in, For Securing a Wide Variety of Doors, Cabinets, Boxes and Trunks Non- swiveling. Adds security for doors, cabinets and gates. Rust resistant. 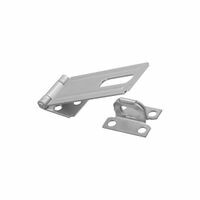 Use on doors, cabinets and gates with a 90 degree corner. Rust resistant. Use on cabinets, doors and gates. 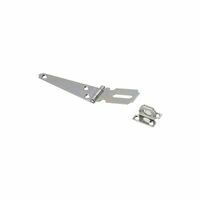 Mounting screws are concealed when the hasp is closed. Non- swiveling. Adds security for doors, cabinets and gates. Rust resistant. Fixed staple. Use on doors, cabinets and gates. Latches without a padlock. All screws are concealed when locked for added security. Latches without a padlock. All screws are concealed when locked for added security. 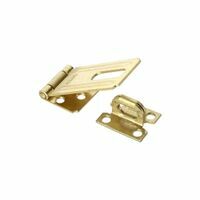 Use to secure chests, cabinets, lockers and door corners. Rust resistant.